« Another Blast of Winter! Weather here today is a little moisture. One can see a hint of snow on roof tops in some areas and other areas are maybe damp. Temperature right now is 35 degrees and it’s only 10:35 a.m.
No generation this morning….as a matter of fact, they are projecting nothing all day! Here is a better photo of Lonnie and his 30 inch rainbow he caught on a hare’s ear nymph this past Sunday. 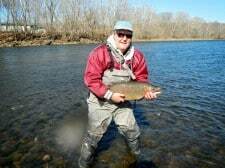 This entry was posted on Tuesday, February 26th, 2013 at 11:37 am	and is filed under Fishing Reports. You can follow any responses to this entry through the RSS 2.0 feed. You can leave a response, or trackback from your own site.